Get close to Adelaide’s main attractions with a stay in Gepps Cross, the gateway to the city’s northern suburbs. 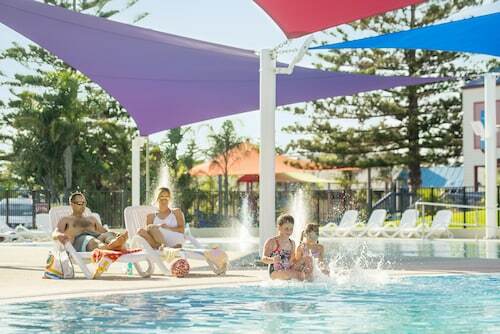 With shopping and markets, parklands, go-karting and a drive-in theatre, Gepps Cross has plenty of family fun. It’s also close to Mawson Lakes, a fancy residential area with a golf course and scenic waterfront walks. If you’re eager to check out Adelaide and don’t want to be in the middle of the city (but just close enough), book your Gepps Cross hotel with us. Gepps Cross is well-known for the five-way intersection on Main North Road, which is where you’ll find most of its retail spots and other cool attractions. Gepps Cross Homemaker Centre is a convenient shopping spot with sportswear, music, electronic goods and fashion. You can find a more personal shopping experience at – of all places – Mainline Drive In, South Australia’s only remaining drive-in theatre. Grab the friends and family to catch a new release movie at night, then come back on Sunday for the Gepps Cross Treasure Market. There you’ll find hundreds of stalls selling fresh fruit and veggies as well as CDs, jewellery, knick-knacks and more. Anything goes! If you want to keep the kids happy, or just have a little fun yourself, spend a day at Kart Mania. This go-karting and laser skirmish complex is the largest of its kind in SA, with a safe and supervised 550-metre track. Put on your helmet and tear around a track that takes you indoors and out, around tight corners and surrounded by a barricade of tyres. If special effects and space battles are more your scene, run around a two-storey laser skirmish maze and zap your opponents as a talking computer gives you advice. Pay a visit to Mawson Lakes to play a round at the golf club or sit in a cafe on the promenade of Sir Douglas Mawson Lake. Even better, go for a walk or bike ride on the footpath around the lake. And while you’re in Gepps Cross, you’ll obviously want to go to the Adelaide CBD and check out the shopping, food, parklands and historic buildings. It really is a great place to visit. There are so many sights in Adelaide worth seeing, from the wine regions of the Adelaide Hills to the beaches of Glenelg. Book your Gepps Cross accommodation and a flight to Adelaide with us today to get started! How Much is a Hotel Room in Gepps Cross? Hotels in Gepps Cross start at AU$103 per night. Prices and availability subject to change. Additional terms may apply.